Check out this music video that was made by a Jayhawk fan using Krizz Kaliko’s KU-anthem “Game On”! 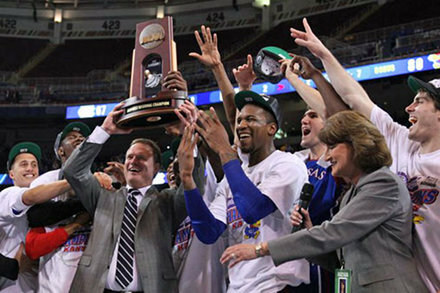 The video opens with Kansas City sports anchor Jack Harry’s prediction that KU would not even finish in the top five of the Big 12, which being that KU is this year’s Big 12 Champs, proved to be wrong. The video then cuts between footage of KU’s victory over North Carolina, the reaction on Massachusetts Street in KU’s Lawrence, Kansas and various media footage. For a KU fan this video is not to be missed! Who are you rooting for in the Final Four and why?